At least one American reviewer of this series has stated he loves the art but couldnt care less about the heavy-handed politics in the series. 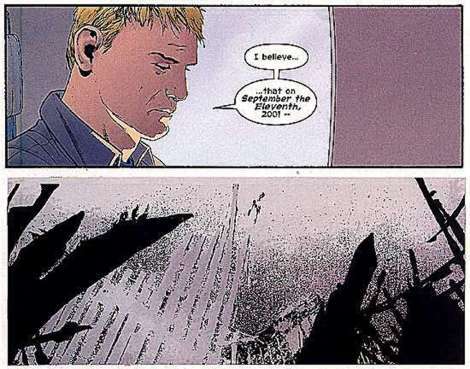 After Sept 11, how do you write about a hero who goes with a name like Captain America? Rieber takes a safe position. Cap is pro-America but not pro-Government. Cap is also not blind. He knows a hero represents all humanity, regardless of race or religion and regardless of citizenship. We have all heard the shouts of "traitor" before whenever someone criticises his government or country. But Riebers Cap is an innocent, almost Christ-like except that he does kill. 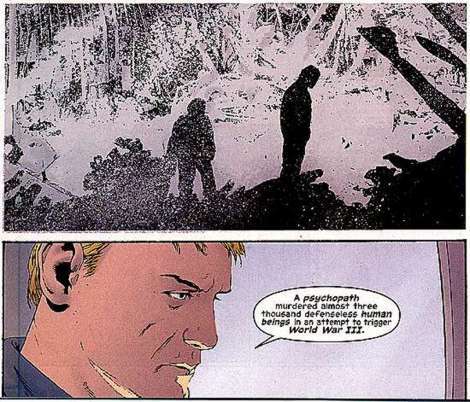 And in the previous issue, Cap kills a terrorist. Of course, there was no alternative. Now he finds that the terrorist was wearing a sophisticated device available only from Americas own intelligence service, SHIELD. He wants to know how the terrorists acquired such hi-tech devices. Its the same old web of intrigue. Long time comic fans long for a fresh perspective on the notion of patriotism. Cassadays art is breathtakingly realistic. The armoured chain-mail and the leather mask, all make Caps costume both colorful and real. 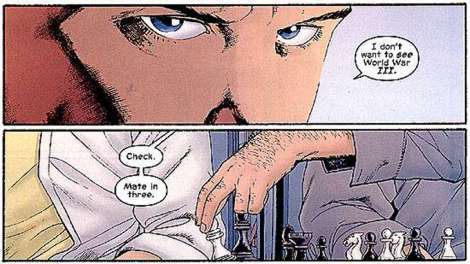 Much of the beauty in the art is due to the fact that Rieber has given Cassaday plenty of wordless panels to play with. Translated that means if you tried to write the story, there wouldnt be too much to write. Terrorists terrorise. Hero arrives. Hero beats up terrorists. Hero finds out the US secret agents are hiding something. Hero goes in search of "truth". Ugh. 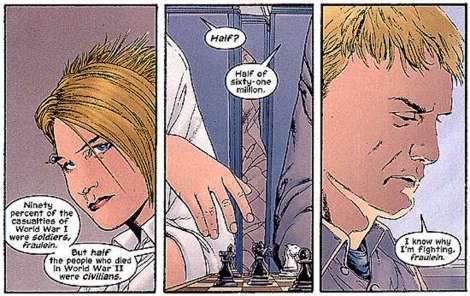 Drawn by Cassaday like a Leni Reifenstahl portrait, a little bit is just about enough. Cap is always backlighted, heroic and manly. The villains are always snivelling, crawling, uttering threats and poor marksmen. With issue #5, the story is beginning to drag. You wonder why they summarise the entire plot on page 1? Theres so much padding, posturing and posing in this issue, your mind wanders and one conclusion it might arrive at is that Reibers plot is one-inch deep. From here on it looks like the "truth" is some crazy "patriot" in cahoots with terrorists for the "greater good" of America. The plot can be boiled down to Bob Dylans plaintive call from back in the 60s. Just who is singing "with God on our side"?